Juddi Ann Everts died on March 24, 2014 at her home in McMinnville at the age of 67. Services will be held Thursday, April 3rd at 11:00 a.m. at Church on the Hill. A reception will follow. Juddi was born on September 19, 1947 in Salem, Oregon to Donald and Vivian Wolff Seavy. 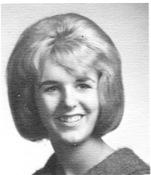 She grew up in Albany and Corvallis, graduating from Corvallis High School in 1965. Juddi married Paul Everts on March 19, 1965 in Corvallis. They moved to Portland in 1968 where she worked as office manager for a surgeon for several years. Juddi and Paul moved to Yamhill in 1971 and started Chehalem Fruit & Vegetable Company serving Yamhill County. In 1990 she started in the Real Estate business, retiring in 2013. Juddi lived life to the fullest. She enjoyed camping, collecting stamps in her National Parks passport and you could always find her working in her garden on a sunny day. She loved to travel to new places and was always ready for an adventure. Juddi was an avid baseball fan and if she wasn't cheering on her Y-C Tigers, she was watching a Red Sox game. She was a huge supporter of youth sports and spent many hours cheering not only her grandkids but all the local teams to victory. Spending time with her family and friends was always a priority. She loved her monthly Bunco nights, having friends over for cards with Paul and her annual trip to the beach with her daughters, sister and Grandkids. Surviving her are her husband Paul, daughters Shelly Kinser and Leslie (Tony) Everts-Wolfe; grandchildren Riley and Braden Martin; Lauren, Jack and Nick Kinser; Meranda and Trevor Wolfe; great grandchild Terrence Zamora; sister Dawn (Doug) Ashpole and brothers Doug (Louise) Seavy and Randy (Sarah) Seavy. Memorial contributions may be made to YCATS (Yamhill Carlton Athletic Teams) in care of Macy & Son. I have fond memories of Juddi and her kindness. Too soon. Click here to see Juddi's last Profile entry.